Ever notice that a lot of the clutter in your living room comes from the number of remotes you have sitting on your end tables? If this is the case, then a universal remote may be the solution to your problem. Depending on what you need it for and how much money you are willing to spend, a universal remote can help your programming needs. If you want to have all of your remote control programming to be in one place instead of switching from one to the other, then you will appreciate the universal remote’s features. One handy feature is that because they control so many different devices, they tend to be a little bit bigger than your standard remote. This makes them harder to lose, especially in between couch cushions. Many universal remotes also have glow in the dark features such as buttons that light up, so that if you are watching a movie in the dark, you can still see the buttons. Also, there are two main types of universal remotes. 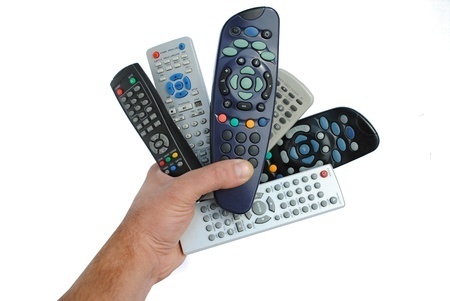 Multibrand remotes are preprogrammed with the codes needed in order to operate your standard electronics. This way, you don’t have to learn the codes needed in order to operate them. Learning remotes, however, go beyond this. They are also preprogrammed, but they also have the ability to “learn” functions. If you hold your universal remote head-to-head with your old remote, infrared signals are sent in order to let your learning remote copy commands that your previous remote had. It all depends on the model. The cost of the universal remote control will depend on how many features it has and how new the model is, but there are advantages for everyone, including those who do not consider themselves to be tech savvy.